Everybody wants to brew the perfect cup of tea. Well, except those silly coffee drinkers, but we usually ignore them on our tea blogs, don’t we? I’ve made it clear on this blog before that I’m not a big fan of tea Nazis, nor do I necessarily agree with folks like George Orwell about what constitutes a “nice cup of tea.” There are many, however, that believe the perfect cup is not subjective and is not open to debate. Some organizations that feel they have the secret well in hand have released official documents describing the process, although I suppose that means it’s not a secret anymore. I’ve recently looked over a couple of those documents that I’d like to share. 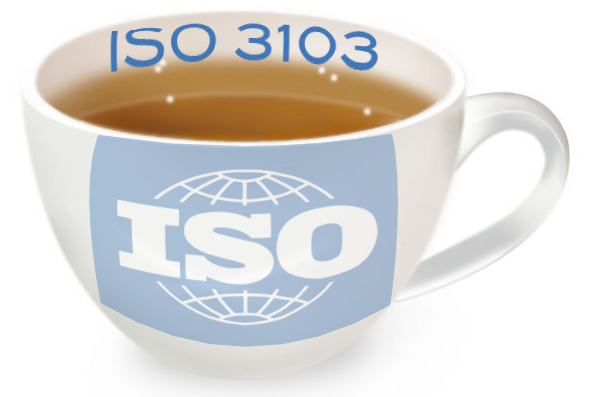 Today, we’ll look at a lovely document called ISO 3103:1980. The International Organization for Standardization (ISO) has developed standards for everything from electronics to language and currency codes to quality control management. They also have a food safety management group that has taken it upon themselves to set the standard for preparing a cup of tea. For those who don’t wish to pony up fifty bucks for the official standards document, there is a summary on Wikipedia. In keeping with their Creative Commons Attribution-ShareAlike License, I shall copy the details here and save you the trouble of clicking on the link. I’m changing their bullet points to a numbered list for easy reference. These numbers don’t appear in their document. If the test involves milk, then it is added before pouring the infused tea. Milk added after the pouring of tea is best tasted when the liquid is between 65 – 80 °C. Clearly, this standard is designed for comparative testing of tea, not for consumption. In my humble opinion, this standard would ruin the majority of the teas that I drink. The water temperature (paragraph 5) would make a bitter mess out of most white and green teas, and the steep time (paragraph 7) would destroy most of the black and pu-erh teas I drink (and the oolongs and greens, for that matter). It surprises me not in the slightest that British version of this work (called, appropriately enough, BS-6008) received the Ig Nobel Prize in 1999. In part 2 of this series, we’ll take a peek at what the Royal Society of Chemistry has to say. Posted on 24 April 2013, in Tea Biz and tagged American National Standards Institute, ANSI, BS-6008, Creative Commons Attribution-ShareAlike License, Ig Nobel Prize, International Organization for Standards, ISO, ISO 3103:1980, organoleptic, perfect cup of tea, Wikipedia. Bookmark the permalink. 1 Comment.